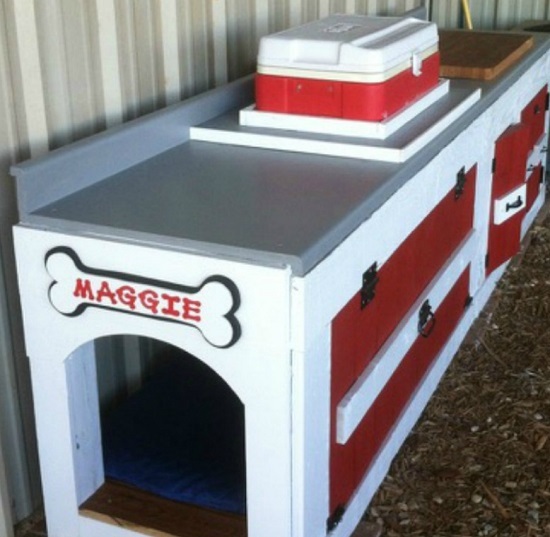 If you’re building a dog house, must check out these 90+ free Dog House Plans & Designs for inspiration in this article. A contemporary spin on the original kennel design, this one includes a shaded porch where your dog can rest in the shade while surveying the garden. Get the DIY here. 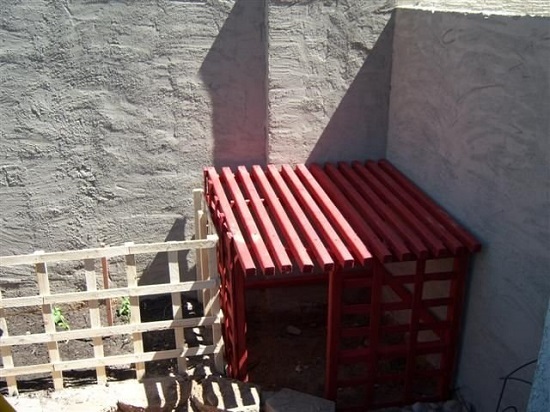 If the thought of DIYing a doghouse seems like too much work, consider this simple design that gives you a weather-resistant kennel with some simple tools and carpentry instructions. 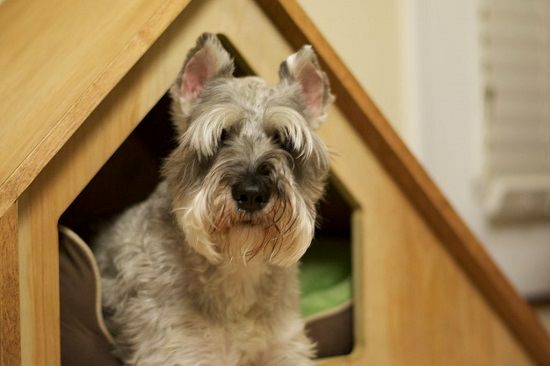 If your dream of a log cabin retreat is a thousand dollars away, go ahead and do the second best thing: Make one for your beloved pooch with these instructions here. This lovely pallet house features a chevron roof for dividing portions of space for different dog breeds. Or if you have just one of them, you can always reserve the largest unit for the bedding and keep the others for food bowls and other conveniences. Get the DIY here. Every apartment dweller wants to reside in cottage style home in holidays, make this dream come true for your dog with this DIY. This minimal and modern concrete dog house does its work–providing shelter and separate space. Watch the tutorial here. 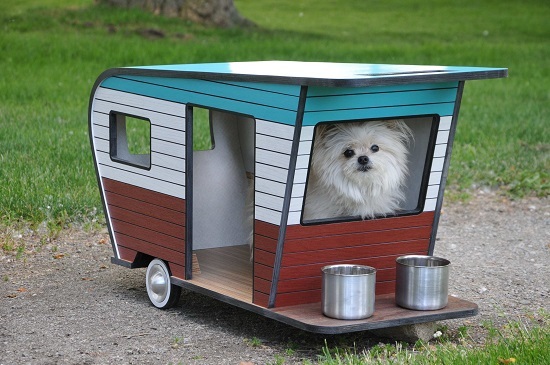 The mobile dog house comes handy if you need to move your dog and his home in the property. Here’s the DIY. 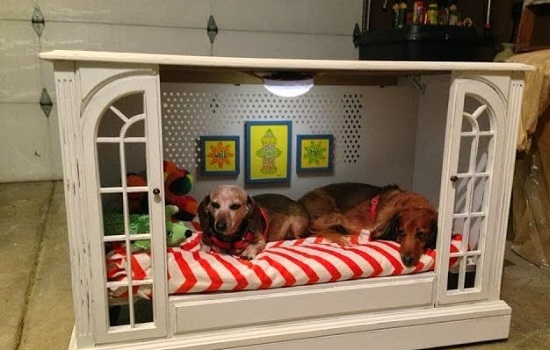 This is a perfect doghouse makeover project with no hidden costs as it uses leftovers scavenged from an old kennel or even your kid’s playpen. Find step-by-step instructions here. 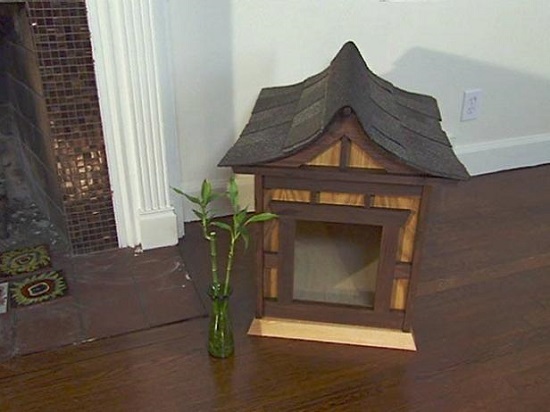 It’s hard to believe the level of detailing that went into a doghouse of such minimal dimensions. 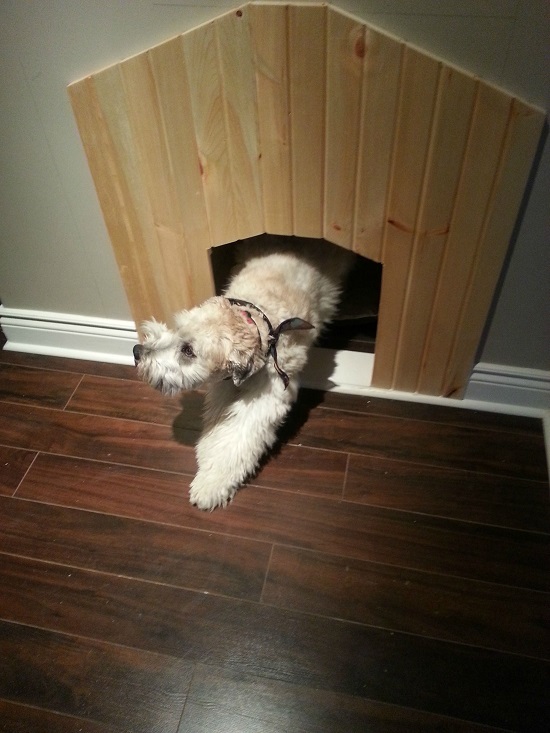 It features a small doggy door and a larger one for human access. Plus, there is a well-planned electrical conduit within to keep the interiors cool in summers. Get the DIY here. Infuse oriental vibes to your home with this cute little doghouse that actually looks like a Zen decor item when placed in the living room. Find the building instructions here. 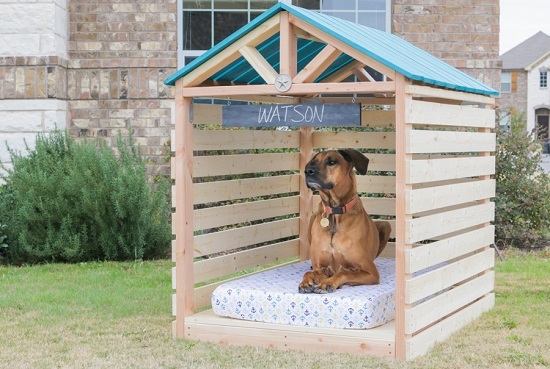 This customized doghouse with its scalable design is easy to recreate for newbies and a nice option for the privacy-conscious dogs that love to protect their territory. Also, it comes with the promise of longevity, thanks to the durable wooden make. Find the instructions here. Not all dogs will appreciate the regular house design to sleep in; some will demand a more whimsical structure to match their playful personality. This DIY shows you how to make one. 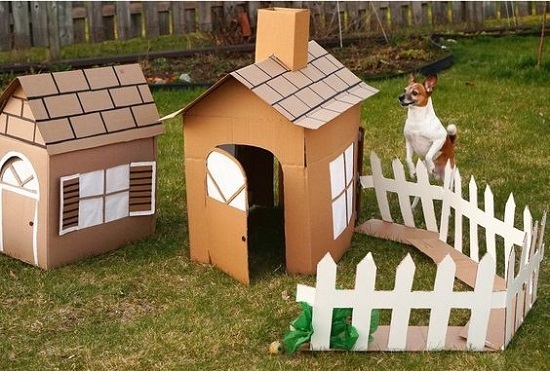 With basic craft supplies like cardboard, glue, and tape, you can make this fascinating doghouse free of cost. Get the guidelines here. Building this cedarwood doghouse from salvaged lumber is an easy and inexpensive way to show him some love. Find the instructions here. Whether you’re looking for a luxurious dog villa or an open frame pergola where your pooch can sunbathe, this DIY video has a couple of plans to get you inspired. This is not one of those fancy aesthetic houses you’ll find in this list, but it’s your best bet if you’re hard-pressed for time and money and just want an emergency shelter for stray pups and dogs to survive winter. Watch the tutorial here. 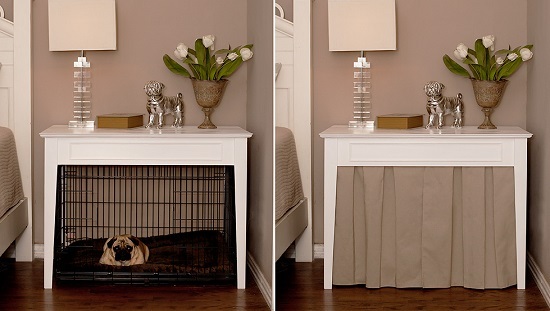 Your indoor pup will love this table-turned kennel. It provides privacy for naps and a roof for keeping a watchful eye around the home. Get the complete outline here. 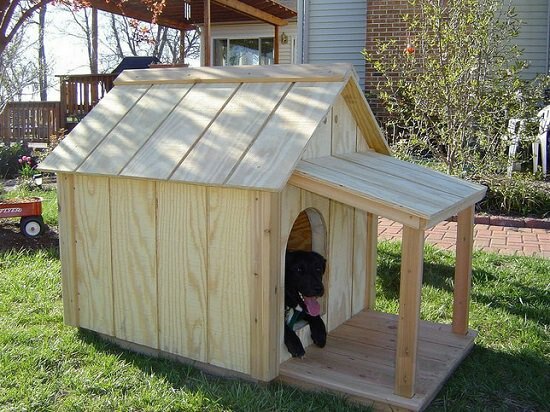 Completing this doghouse plan will give you a 9 square feet base that is perfect for housing medium-sized dogs and tapered structure that reflects excess light and keeps the interiors cool. Get the blueprint here. 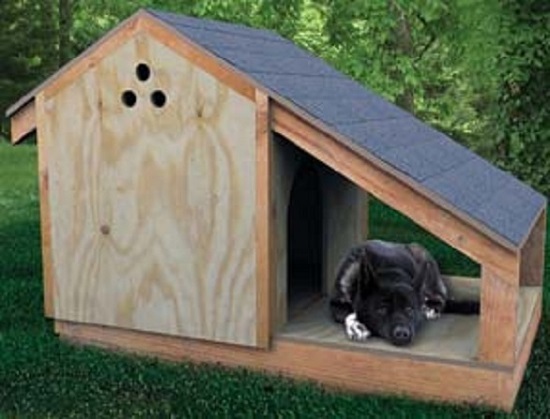 For small-sized dogs who like sleeping outside, this insulated plywood house is a nice solution. It features a classic design but the curved dome-like roof is what sets it apart from the others. Find complete instructions here. 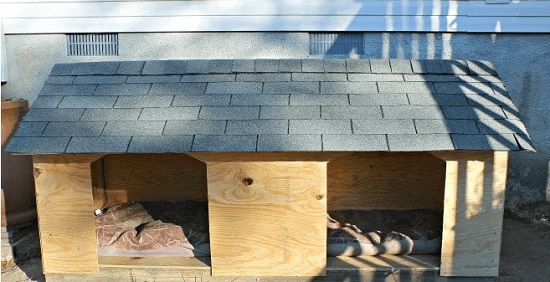 Box doghouses with a hole for a door may be good enough for your pooch but you can always go a step further and add porch roof to provide shelter so that the rain doesn’t hit his ears. Get the DIY here. 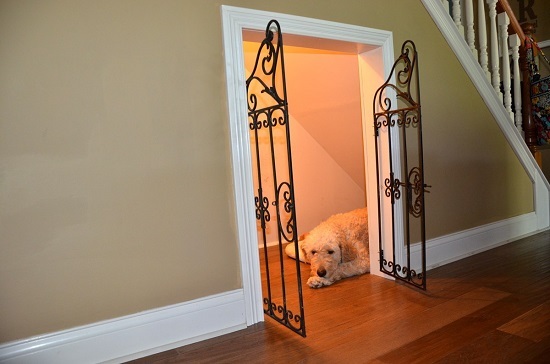 Utilize the space beneath the stairs to make a private and cozy home for your pooch. Find the instructions here. 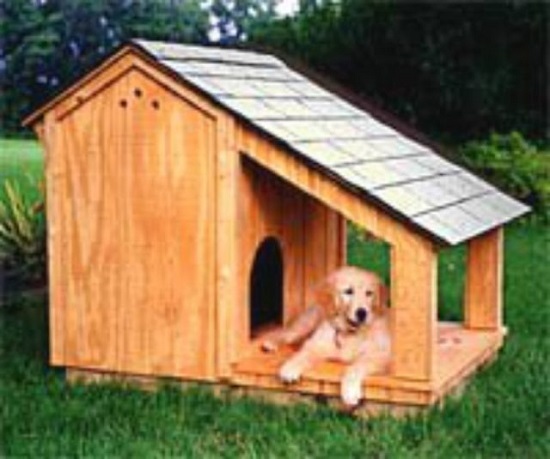 If conventional dog house plans are too outdated to match with the idea in your mind. Opt for a more contemporary design, as this DIYer did. 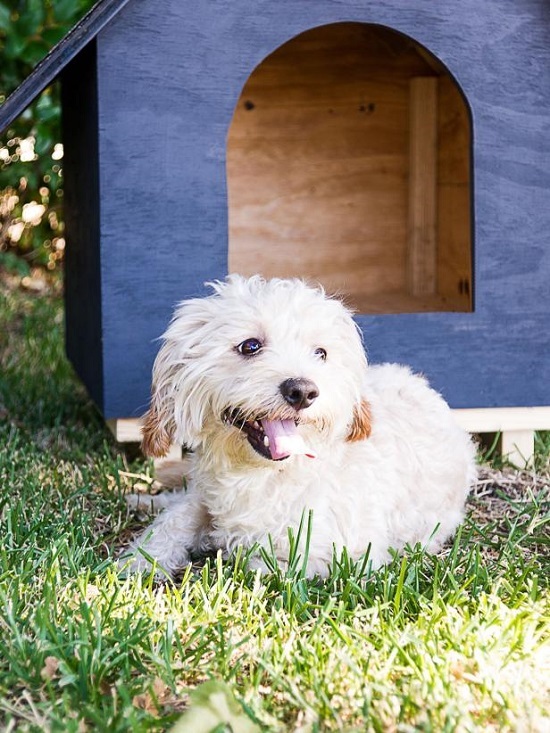 The fun part of this free doghouse blueprint is that it leaves your dog spoilt for choice-whether to choose the comfort of the interiors or sleep on the roof that can be made to fit him exactly. Find more instructions here. Made from three plywood sheets, the ranch-style doghouse is big enough to accommodate the bigger breeds and is perfect for people who want to give their dogs the luxury they deserve. Here’s the DIY. 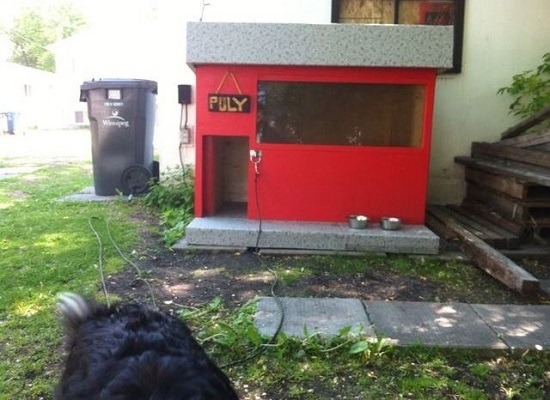 This dog house provides better visual appeal than many other DIY dog houses in this list. Find the instructions here. If pallets are out of your reach, take the help of Ferro-cement. It’s easy to find, inexpensive and incredibly strong, meaning your dog will have year-round protection from hail, storm and even nuclear detonations! Get the steps here. 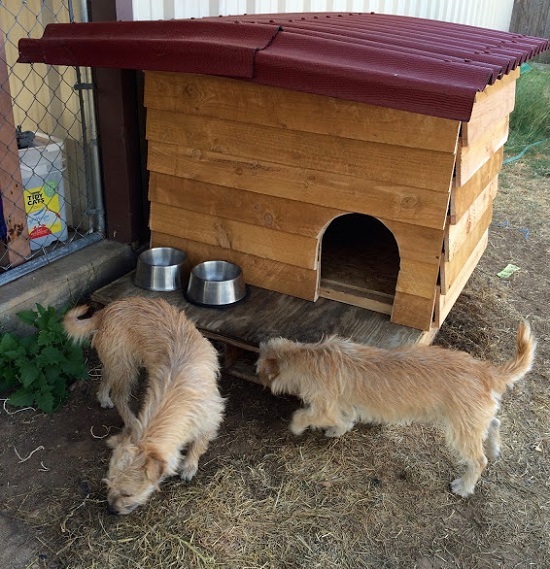 If you’re looking to refurbish your dog house occasionally by adding extras like a slanting roof or a porch, you need a structure that is easy to adapt. Take a look at this DIY for inspiration. 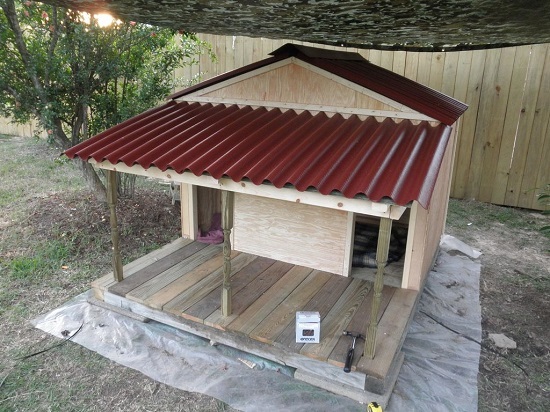 The knock-down frame construction of this doghouse facilitates solar heating and torsion box walls that allow ample room for insulation. Find the tutorial here. 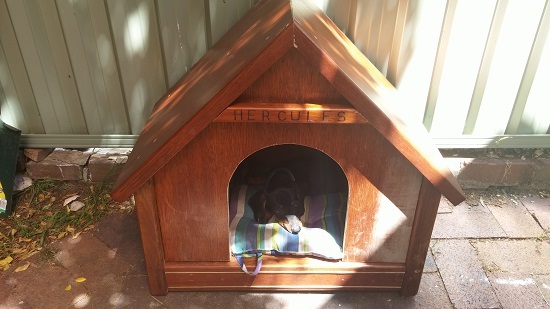 Upcycle an old dog house to make a new one like this. The plan and instructions are here to follow. 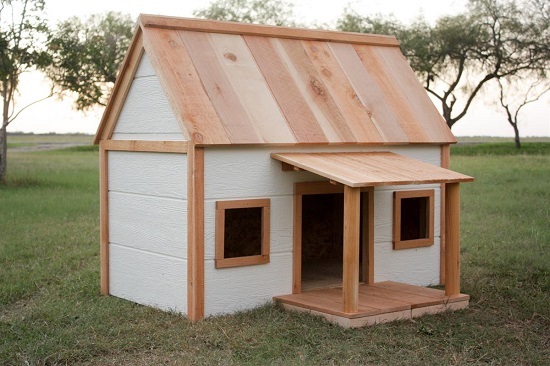 Build a dog house that looks no less than a human house with an amazing exterior. Here’s the DIY for it. The big doghouse design comes handy when you’re looking to house a horde of puppies with their mommy during the frost. Get the DIY here. Another giant doghouse plan, this one uses robust asphalt shingles for the roof. Learn to assemble it here. This simple yet chic looking house with its minimalist detailing is a nice place for your dog to spend time in while you’re out in the town. Find the tutorial here. 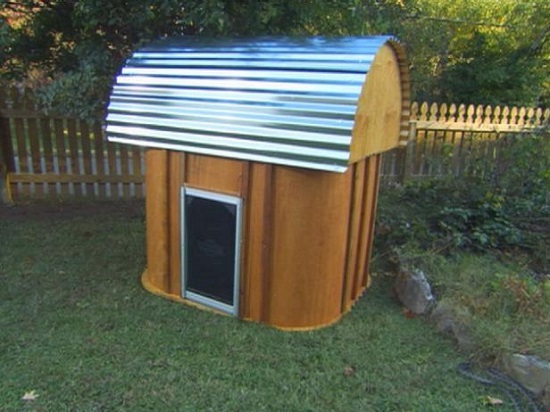 A budget DIY dog house idea that follows the classic plan, making it perfect for newbie builders. Here’s the DIY. 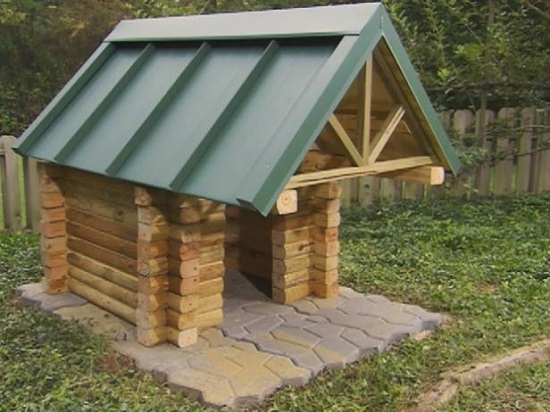 This basic dog house plan looks good both indoors and outdoors and it is easy to build as well. Get the instructions here. 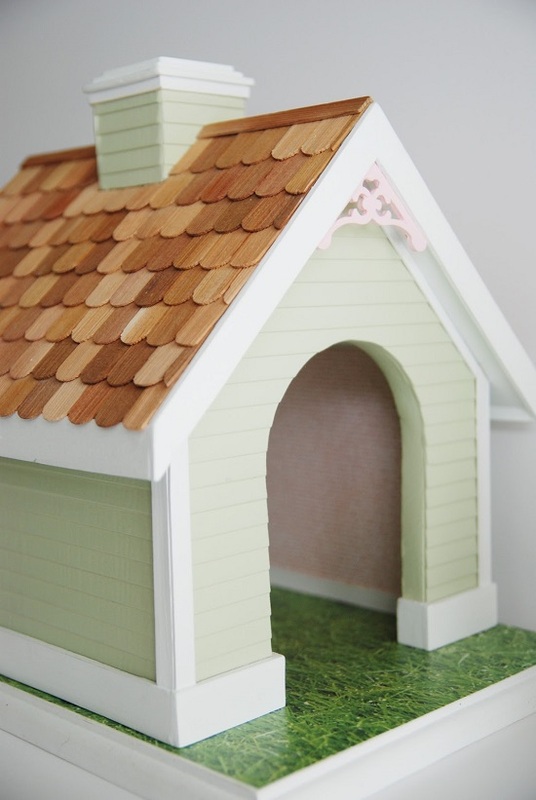 In this DIY, contrasting paint and asymmetrical panels help add a whimsical touch to an ordinary doghouse, making it perfect for livening up the yard. 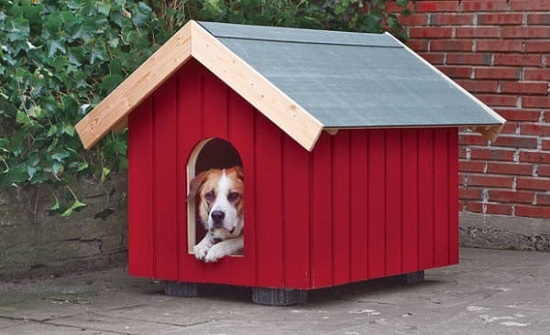 A unique spin on the routine doghouse designs, this one is especially suitable for dogs that hate staying indoors. You can add the stairs to enable easy access to the sun deck at the roof or simply stick to the classic platform layout. Get the DIY here. 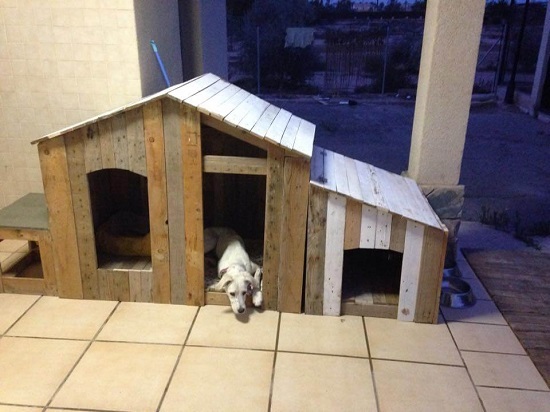 This rather intuitive doghouse design includes a spacious ramp for easy access, an elevated floor for insulation and a shaded patio for relief from the hot sun. Make one with these instructions here. 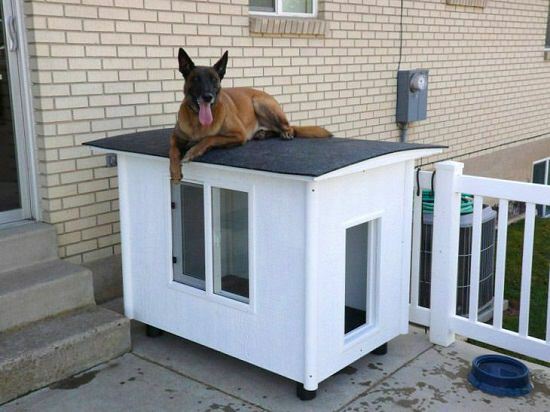 Your dog deserves more than a flimsy kennel; make this solid, windproof unit with a slanting roof that will allow him to climb up and nap in the sun as well. Here’s the complete tutorial. 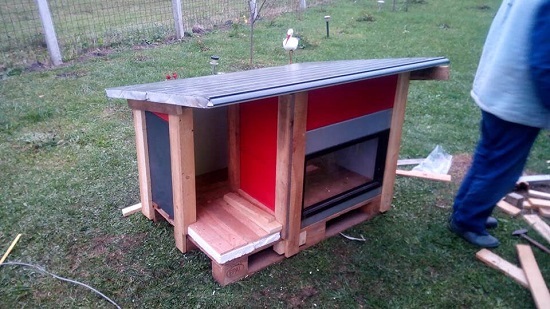 The raised dog house design is always the recommended plan for areas that are cold around the year. 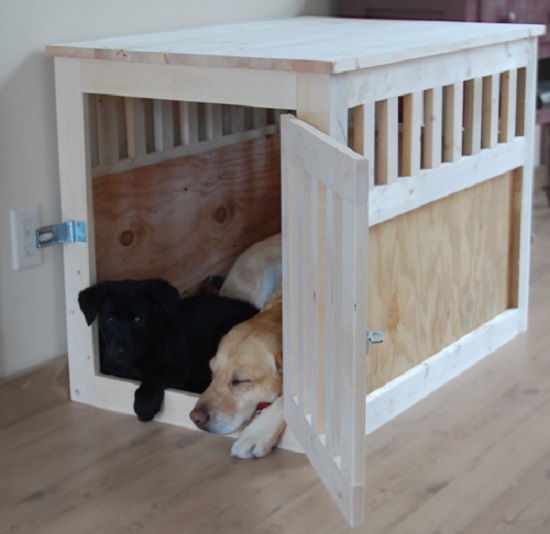 This DIY gives you the outline for a small house but you can always scale up the size to accommodate bigger dogs. 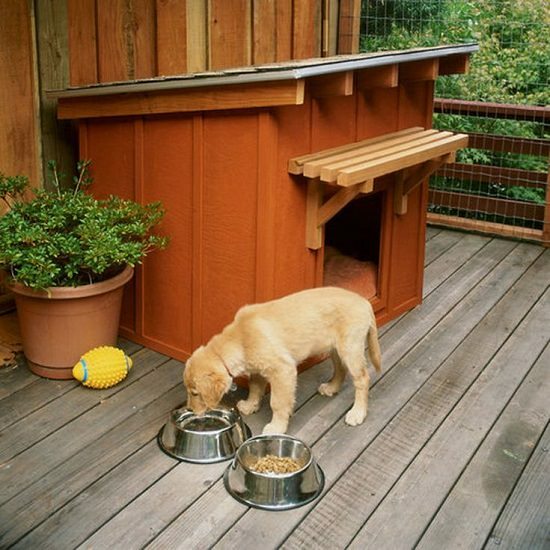 You can make a basic kennel design look spectacular just by choosing the right shade of wood. This DIY has some ideas. It also shows you how to make the roof detachable without interfering with the insulation inside. 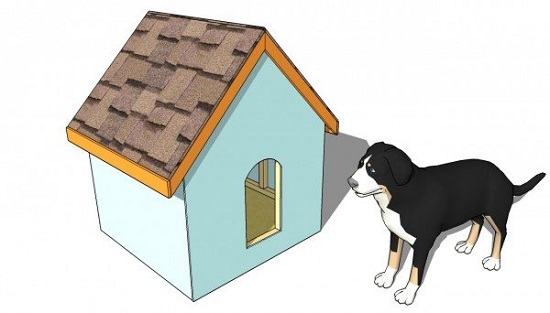 If you own a guard dog, this doghouse structure will not block his side view. Here’s the DIY for it. This cute little wooden house is made by simply assembling wooden pallets and adding a roof to create a box-like structure. The interiors can be customized as you like. Start with these instructions. 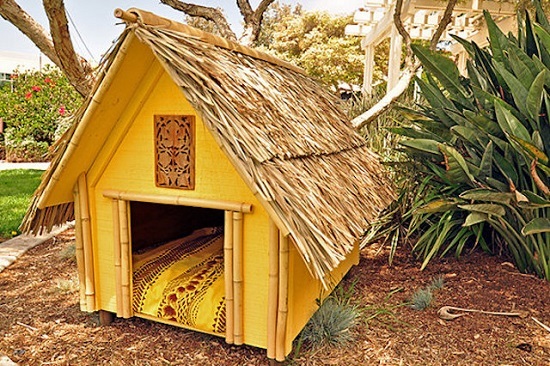 If you want a leisurely dog house for the summers, there’s nothing better than this tropical design. It has higher ventilation and a roof that minimizes heat absorption. Plus, the extended base makes for a nice lounging area on cool evenings. Get the tutorial here. 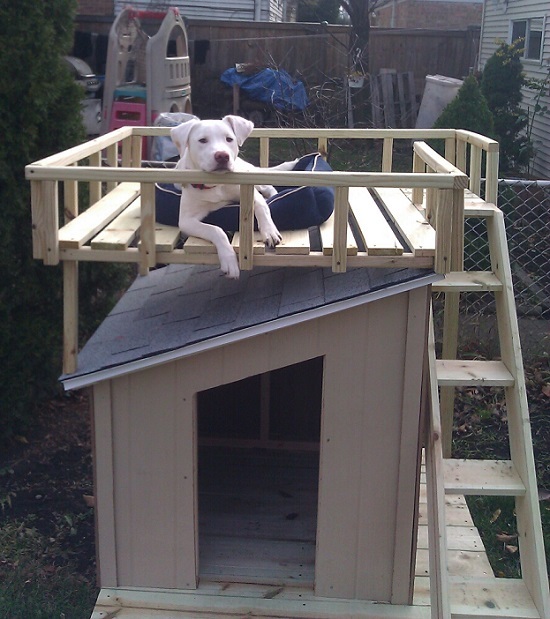 This DIY includes a free plan for building houses for medium-built dogs ranging up to 50 pounds. This DIYer shows you how to create a stylish wooden house that will make a nice home for average to a bit large size dog breeds. 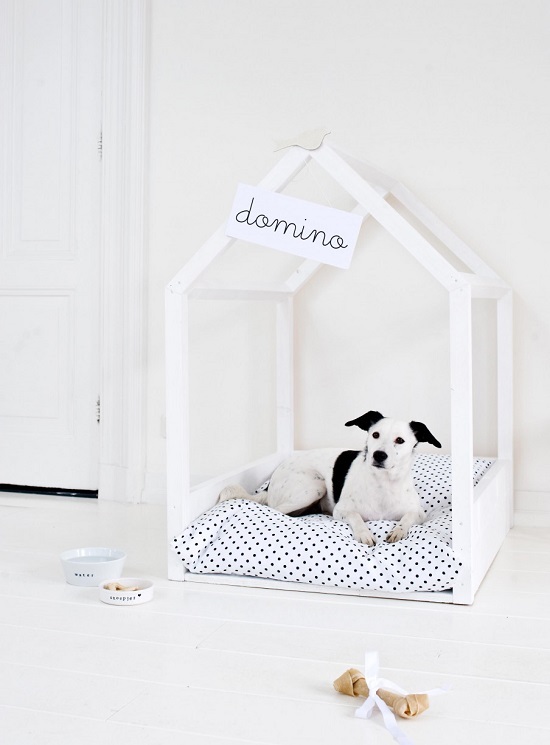 The raised dog house is always a hit among all your pets and even your toddlers. After them, you can always keep it as a nostalgic nook in the garden. Get the tutorial here. 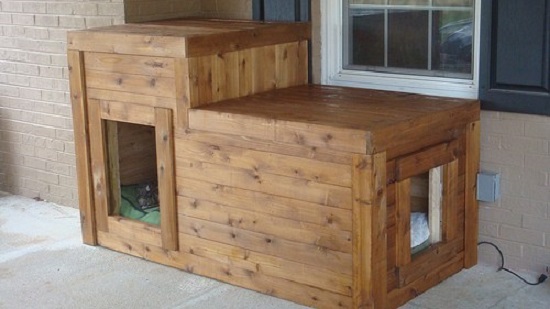 This adorable dog house design is perfect for utilizing empty space underneath the stairs. Here’s the DIY. This is just the kind of house that you would want to stay in if you were a dwarf or a dog for that matter. 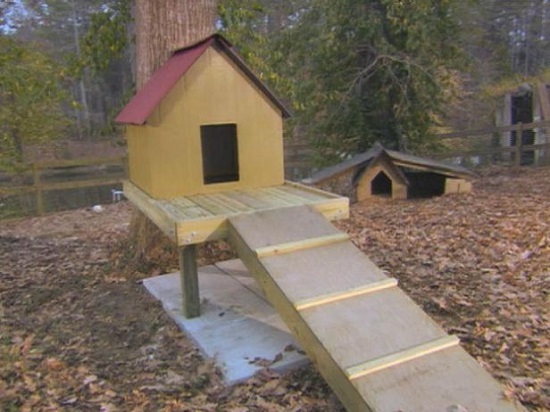 It features a slide-in door for easy access, a slanted roof design to deflect sunlight, as well as a front porch for keeping food and water bowls. Get the DIY here. 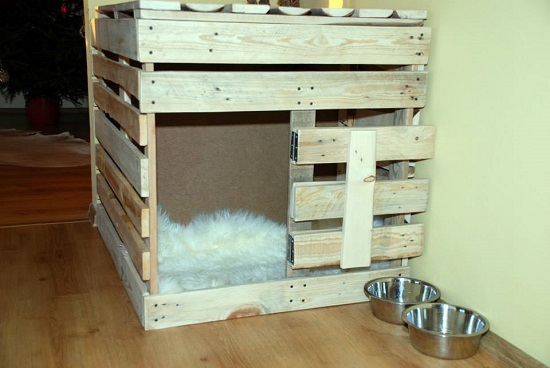 This dog plan requires you to just assemble a few wooden pallets into a cozy box with a tiny door in the front. That’s it, no extra tools, no extra investment. Here’s the DIY. If you think about it, your old refrigerator deserves a second chance before hitting the dumps. 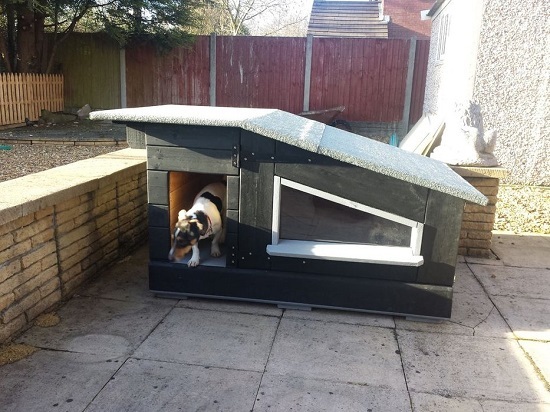 With its insulation and design detailing, it could make a nice outdoor house for your dog in the summer. Get the instructions here. 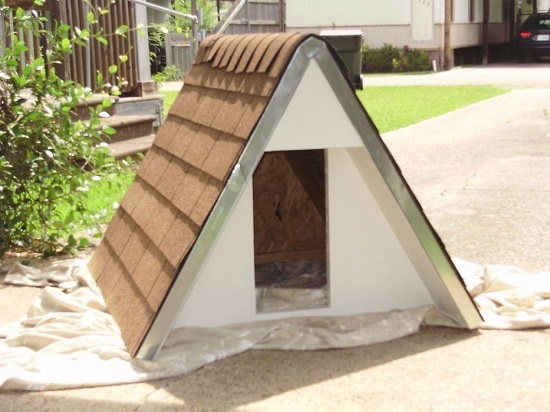 If summers are particularly hot where you live, your pooch could benefit from this dog house design that not only offers shade from the sun but also prevents overheating, thereby keeping the interiors cool and ventilated. However, you’ll need to keep it away from the sun. Dog accommodation units don’t have to be functional only; they can have a decorative value as well. Here’s more on it. This is a neat DIY, the tutorial is available in Dutch, which you can translate. This charming doghouse with its cool, beachy colors is actually made by inverting a table. Watch the video for more details. 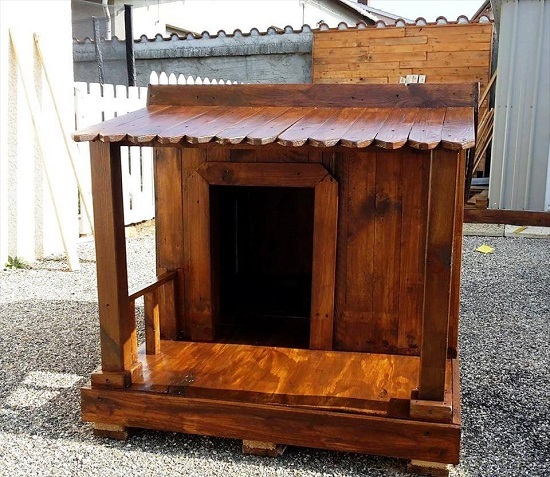 What makes this dog house special is that it is made from door panels and pallets used to build human houses, meaning you get to mimic the same level of durability and comfort that you have for yourself in your modern house. Get the tutorial here. 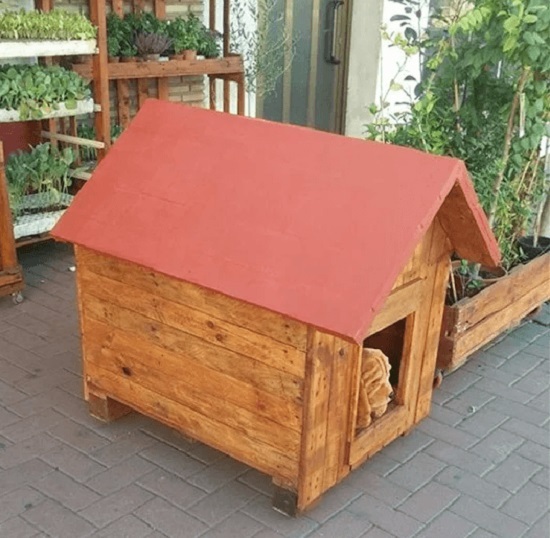 This tiny little masterpiece with its wooden shingle siding, a slanting cedar roof and an extended patio for keeping food bowls definitely make it one of the best dog house designs to follow. Get the DIY here. 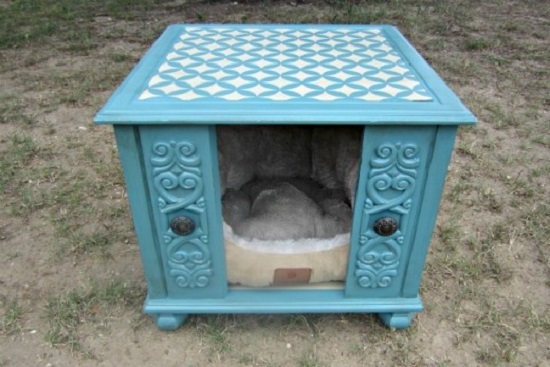 Why spend on expensive dog houses devoid of character when you can easily convert an open end table into a cool accommodation unit using stencils. Learn all the steps here. 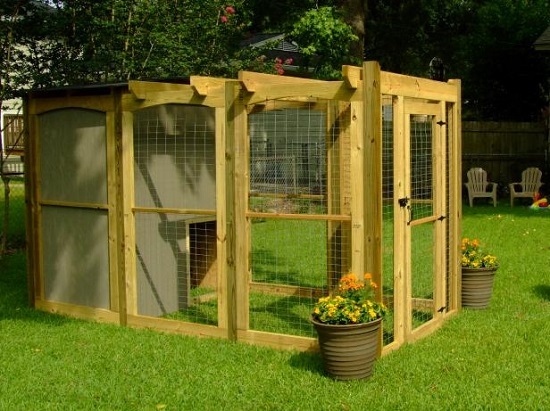 Big dogs that love a frequent whiff of outdoor air are sure to appreciate this spacious doghouse design with its pergola structure and sturdy wired fencing. Find the idea here. 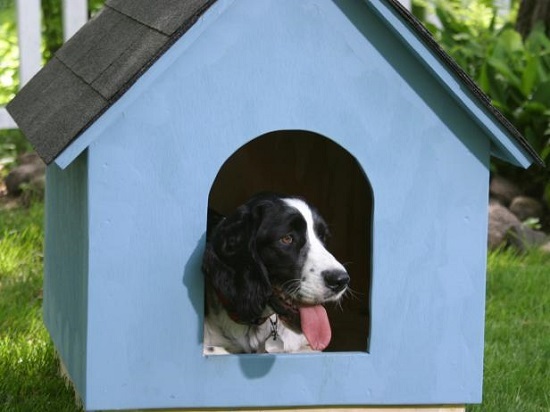 Gabled dog houses are a thing of the past, don’t you think! 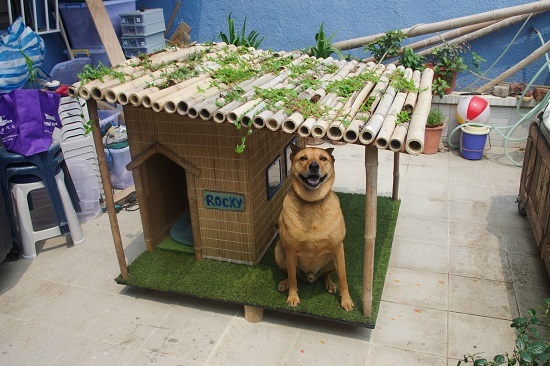 Today’s dogs need a cool, weatherproof house that reflects their human’s personality. 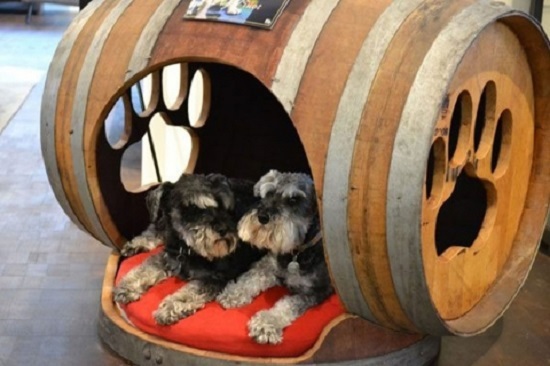 So if you drink to stay alive, this wine barrel doghouse DIY is for you. A year-round relevant doghouse demands not only adequate insulation but also shaded, rainproof covers for complete protection, as well as the convenience of surveying outdoor life. Get the DIY here. 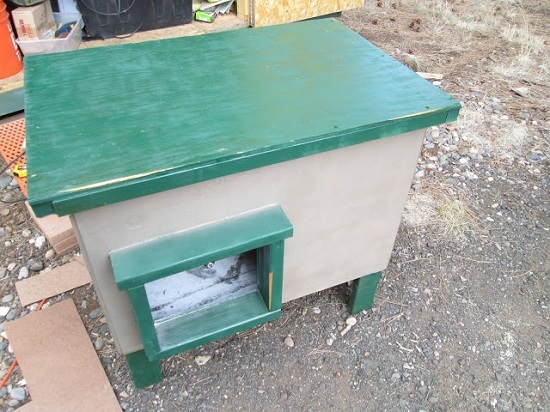 This doghouse design utilizes unstained cedarwood, which is a natural insulator, as well as an installed heating system for owners who want to go the extra mile to keep their pooch warm and cozy on winters. Find the tutorial here. 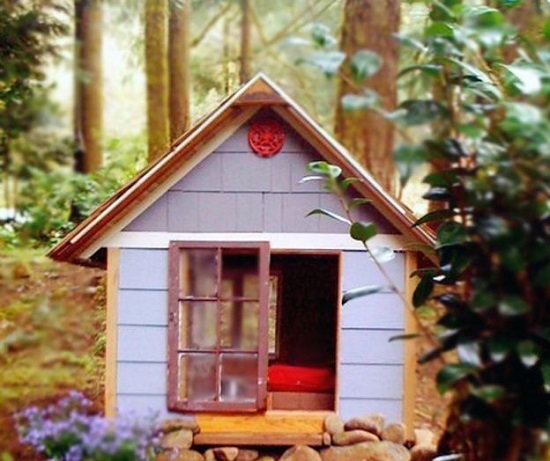 Building an old-fashioned dog house is a nice way to get started. Use light, unstained wood and stack up with straw for a rustic look. Here’s the complete tutorial. Nothing like yellow paint to spice up a simple classic doghouse design. Prop up the insides with plush bedding that matches it. Now isn’t that an easy way to spread tropical vibes in the garden. We found the idea here. One of the best DIY Dog House Plans in this list here shows you how to create a landscape doghouse with a tiny pool and a verandah as well. 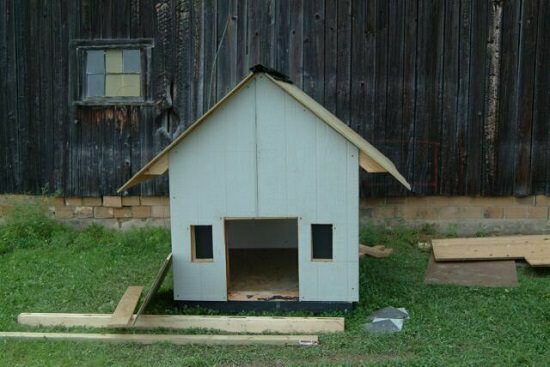 This guide gives you some clever hacks to create inexpensive dog houses. Cabin-style homes are an instant hit with pets looking for privacy. This DIY shows you how to make one. Do you want your dog to sleep in your room all the time? Well, here’s an easy to way to ensure that. Follow this DIY and make an open frame with a spongy bed that is too inviting to resist. Building a sled dog house has numerous advantages over square style ones. For example, it is low-maintenance and easier to clean. This DIY is easiest, it can be done in an hour, making it a perfect project for beginners. Find all the instructions here. This mini automobile like dog house is really interesting, learn how to make it here. 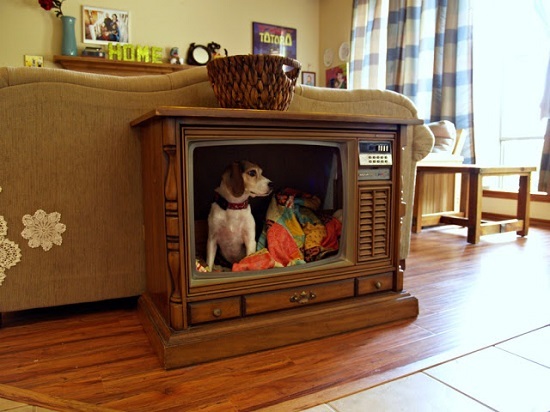 One of the most creative makeover projects in this list of dog house ideas you can undertake at your home is converting an old console television into a vintage dog bed. Here’s the DIY. Can’t take your pooch on your vacation with you? Show him your love with this summertime home instead. It has an open airy structure for ventilation and a double door for easy access. Follow the tutorial here. 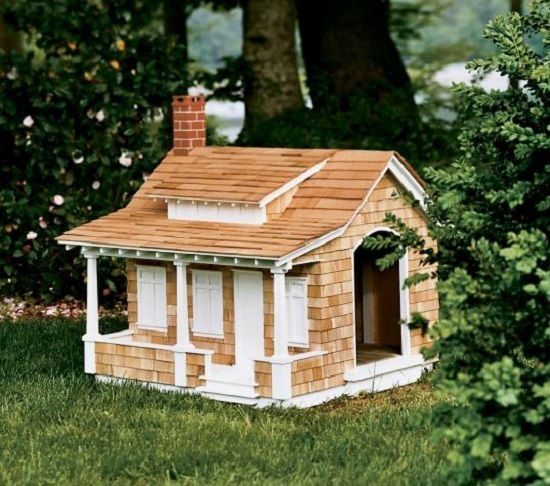 If you’re looking for ultimate dog house plans that look inviting inside and outside, here’s one of them with some curb appeal. This DIY shows you how to give new life to an old kitchen cabinet that you’re intending to get rid of. 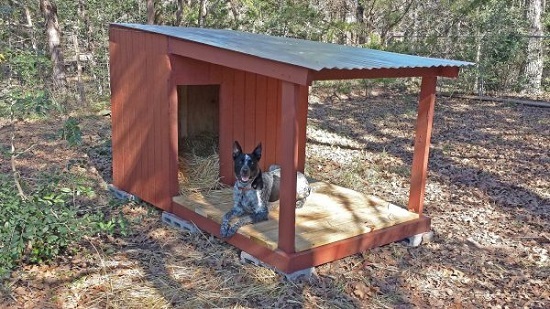 This DIY outlines a basic doghouse structure with a couple of interesting features, including corner posts that increase rigidity and offer protection from sharp winds. If you have a child that loves model building, don’t hesitate to involve him in this dog house project. He’ll have ultimate fun assembling the shingles and painting the sides. Get the complete instructions here. 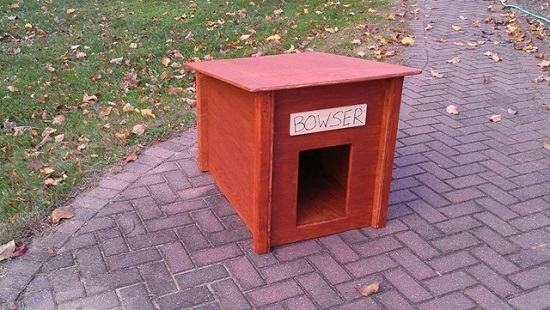 Give a unique spin to your old bulky consoles with this one-of-a-kind doghouse idea. If you plan on keeping your pooch indoors for extra safety in the winter, consider going with the double door crate house. It is easy to clean and the size can be customized to fit empty corners like the underside of a bedside table. Get the instructions here. 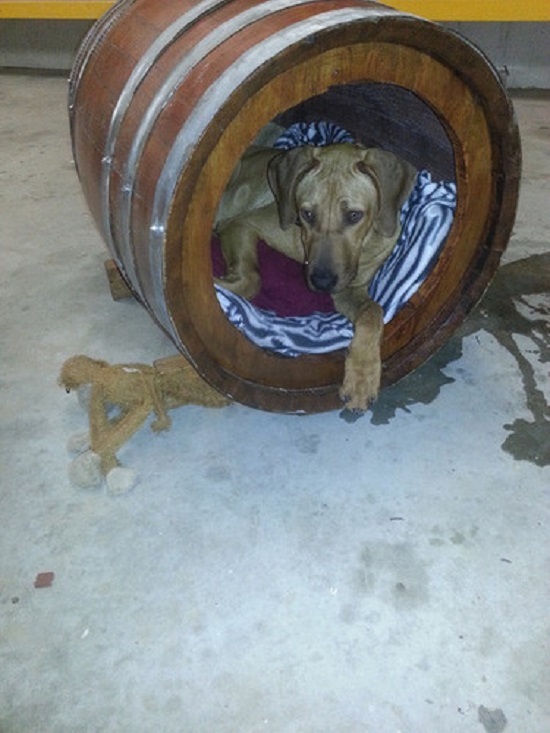 If regular dog house designs are too hideous for your liking, consider making one from an upcycled barrel. It will accentuate the garden decor nicely and save you some bucks as well. Here’s the DIY. 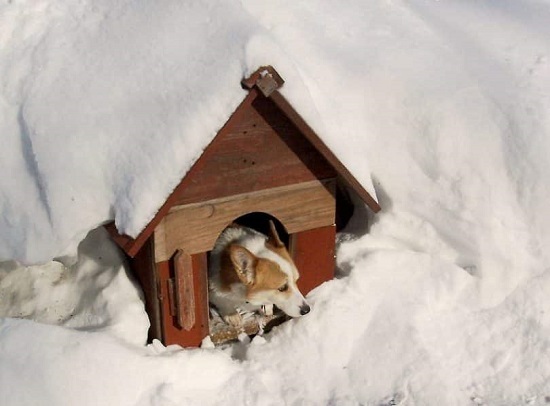 Even cold-hardy dogs need a warm and sturdy shelter that can keep them safe from harsh winters. In this guide, you will learn tips to winterize existing dog houses and even build them from scratch. 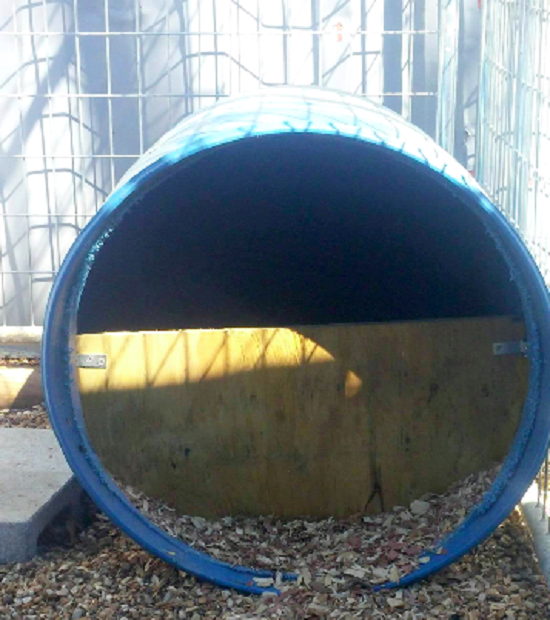 This sled-type dog shelter includes foam insulation to trap in body heat and block out the elements. 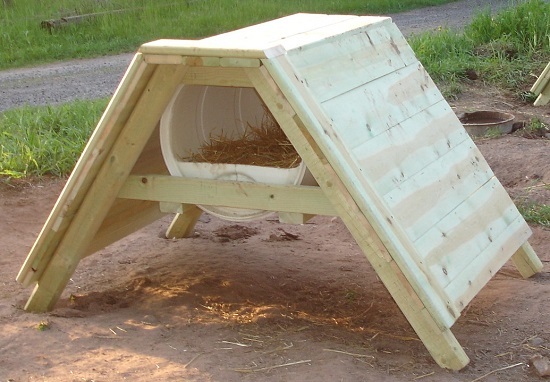 Pile up with straw and you’ll have a windproof haven perfect for huskies that live fulltime. Here’s the DIY. 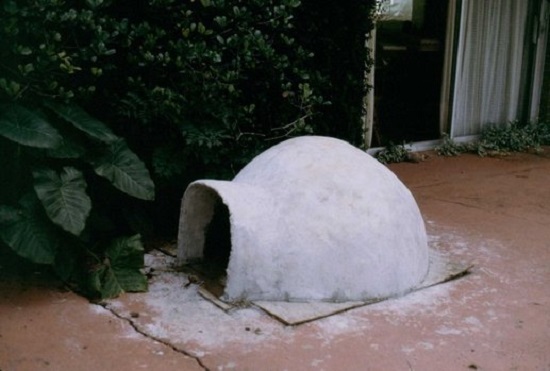 If you want a doghouse that provides warmth in winter months, consider this idea. It uses an asphalt roof and walls made by assembling fence pickets from an old garden wall. This DIY is a full-blown woodworking project that requires you to have advanced skills. However, you can always replicate this design using wooden pallets and a solid chunk for the detachable roof. Follow the instructions here. 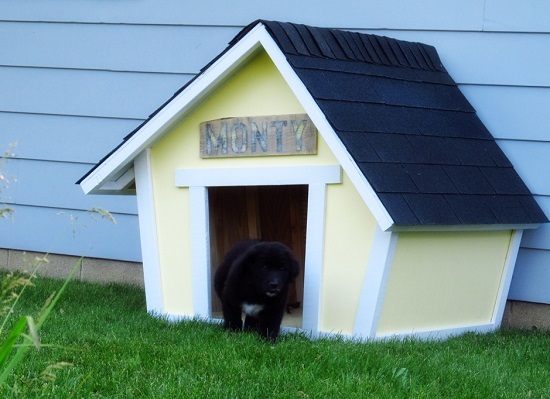 Many of the dog house plans involve woodworking, but if you don’t have carpentry skills, take the help of this cardboard house DIY. This ingenious DIY lets you make good use of all the lumber logs you picked up during your winter hikes. 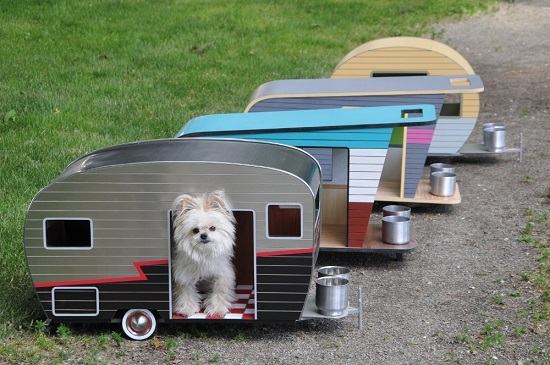 The end result is an insulated, artsy home perfect for mid-sized dogs. Want to build a dog house with a shade porch? This guide has answers. With a thick plywood exterior and styrofoam insulation within, this durable yet lightweight doghouse provides protection from inclement weather and is portable to boot! Find complete instructions here. 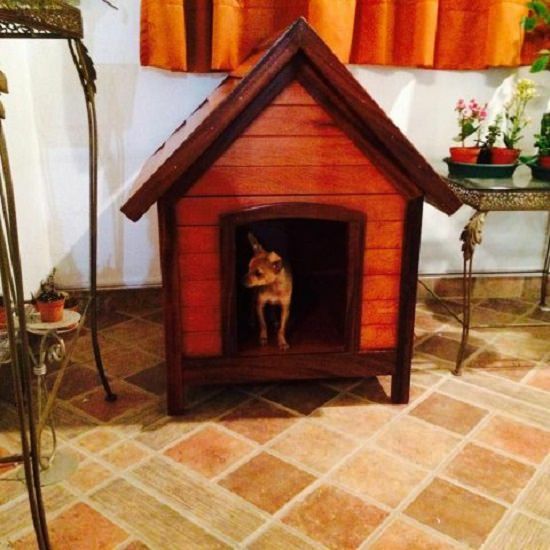 How about building a doghouse that looks as royal as your dog! Head over to BHG for the DIY. 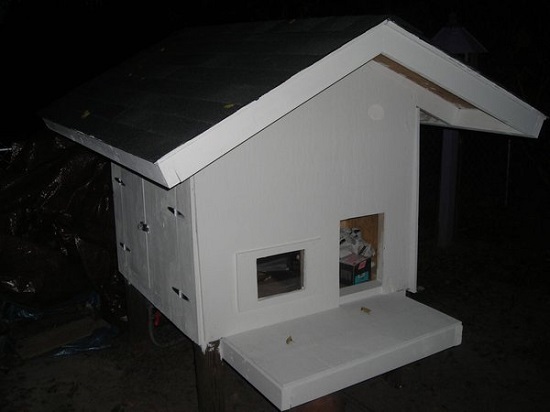 This is a classic doghouse design involving a single plywood sheet and some other carpentry materials. Here’s the detailed DIY. 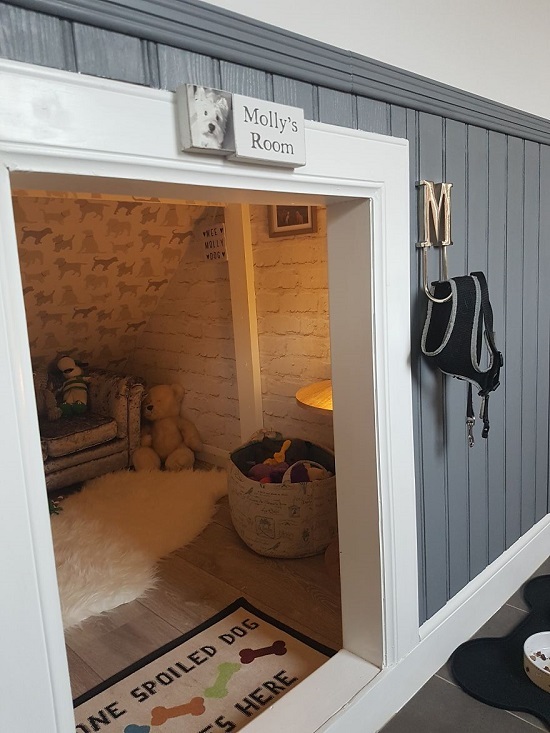 Convert space under the stairs into a cozy nook for your dog, make it attractive with a nametag, some fluffy bedding and a couple of chew toys. Here’re the steps. 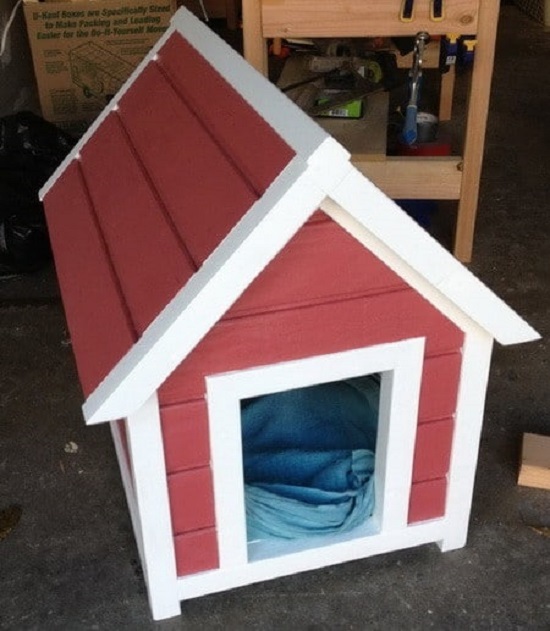 Perfect for small to medium built dogs, this DIY shows you how to make a gabled roof house from a single sheet of external-grade plywood and some paint.